If your second-grader discovered something other than soccer and a swimming pool that would pry her away from TV, you'd throw a party, too. Chess, the 7th century game of India, has become the unlikely rage of the summer in Malibu. Chess clubs run by dedicated teachers have kept the game alive for years. But in 1994, Eric Hicks, a high school dropout from Hawthorne who found direction in his life when he took up chess in a serious way (even though he went on to graduate with honors from UC Berkeley), started organizing after-school Academic Chess programs in many parts of Southern California. In Malibu, at the Knights by the Sea summer day camp, Kate Crocker is pied piper to the Academic Chess players, including my own 7-year-old Melanie. The soft-spoken "chess lady," as the kids call her, starts with the form and function of each piece. "This is ashtray head; he's also called the rook," she tells the kids. Her presentation is packed with rap, rhyme and disco moves. It's hard to say who's more enthralled, parents or program participants. 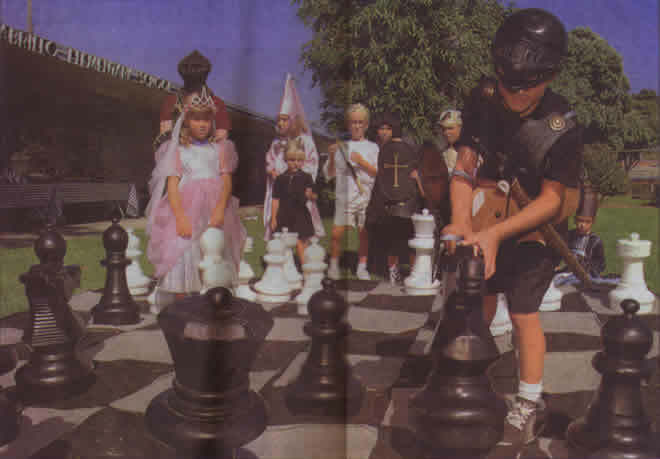 By the time the program is in its final weeks, several parents are ready to reward the kids with an end-of-camp chess costume party. I ask a friend to coat a "treasure box" with candy coins and hard candies and sugarcoated fruit jellies in the colors of rubies, emeralds and amethysts. This will be filled with black, white and red candy delights. Only a few days before the party, everything seems in place. Then, two days ahead, parent volunteers cancel commitments for a vegetable platter and game prizes. No problem. Eric, the deli manager at Ralphs, offers a brochure. I ask if he'll skip the greens and alternate colors - red radish, jicama, black olive, cherry tomato, cauliflower and red bell pepper. He suggests white enoki mushroom and adds purple cabbage dividers. I pick up the platter four hours before the party. As for prizes, toy stores are short on Camelot. I try the Game Keeper, found in most larger malls, and gather chess puzzles and more. Setting up is a challenge. Other activities are going on at the camp here at Juan Cabrillo Elementary School, and the summer weather has camp and party competing for the same shade. But two moms show up an hour before the party with babes, brie, crackers, cookies, candies, chess-cake and a willingness to help out. My best pal brings five little ones and an amazing clean-up stamina. As the kids begin arriving in costume - child knights and damsels, pint-sized pawns and rooks - we're ready. There are tables set up for chess and, even better, a larger-than-life lawn chess game whose pieces reach above most of the kids' knees. Our opening move in the menu. Malibu moms Annie Donnellan and Gabrielle Harris have just launched Indigo Cafe at Kanan Road and Pacific Coast Highway, and the chef there, Trudi Reynolds, has three kids and gets the concept. They will take care of a big portion of the feast, and we gather an army of possibilities, prepared to surrender pieces along the way. The Queen's Pawn Salad is banished from the buffet. A Marshmallow Moat sinks before the drawbridge. Ditto the Gingerbread Castle. Bishop's Havens begin as stuffed pita pockets and become turnover hats. Scepter Satay (chicken wands topped with paper crowns a la rack of lamb) changes to Sweet and Sour Scepters when it's discovered that peanut and plum sauces aren't to the kids' tastes. And the crowns don't seem to affix easily. For the Bishop's Hats, adults do well with puff pastry, but for the kids we decide to go with pizza dough. Reynolds takes on cake tactics. 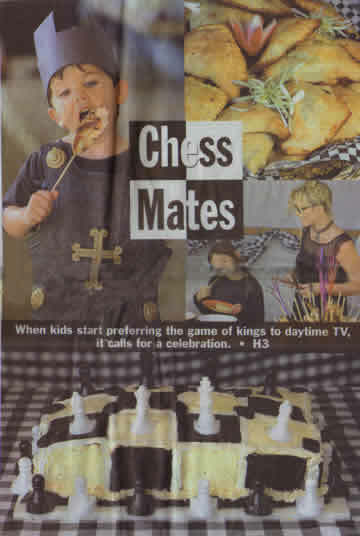 Of course, it has to be a chessboard cake. Reynolds comes up with a plan that combines white cake with brownies, which provides a nice chewy contrast to the fluffiness of the cake. The problem is getting the brownies and cake pieces to stay in place, but frosting works wonders as glue. We herald a costume parade and set the mood with baroque hit-meisters. Handel and Vivaldi are good, but we try not to overdo it and switch to Spice Girls when the kids seem as if they're starting to fade. We give awards - Best Dressed Younger Knight, Most Improved Player - based on the kids' costumes and their performance during camp. A trivia quiz follows, with children divided into two teams. Questions came from the chess teacher: How many pieces go on the chessboard? Who's the world champion? What's the least number of move possible for checkmate? In the end, we have to trust the power of play. Damsels give chase on the lawn. Knights are bold in mock swordplay. A neighborhood dog adds to the frolic. And all the players are winners.